1. Fall protection: 7,270 citations—Falls from ladders and roofs still account for the majority of injuries at work, and the first step in eliminating or reducing falls is to identify all hazards and decide how to best protect employees. 2. Hazard communication: 4,552 citations—This standard governs hazard communication to employees about chemicals that are both produced or imported into the workplace. Most violations concern the failure to develop a written hazard training program or failure to provide a Safety Data Sheet for all workplace chemicals. 3. Scaffolding: 3,336 citations—The vast majority of scaffold accidents can be attributed to planking or support giving way. Employers should ensure that all scaffolding is set up and inspected by a qualified employee before it’s used. 4. Respiratory protection: 3,118 citations—Employers must establish and maintain a respiratory inspection program to protect employees from oxygen-deficient atmospheres and hazardous materials. 5. Lockout/tagout: 2,994 citations—Employees who service mechanical and electrical equipment face the greatest risk of injury if lockout/tagout standards aren’t properly followed. 6. Ladders: 2,812 citations—Most ladder violations occur when ladders are used for purposes other than those designated by the manufacturer, when they aren’t used on stable surfaces or when defective ladders aren’t taken out of service. 7. Powered industrial trucks: 2,294 citations—Many employees are injured when lift trucks or forklifts are driven off of loading docks or when they fall between docks and unsecured trailers. 8. 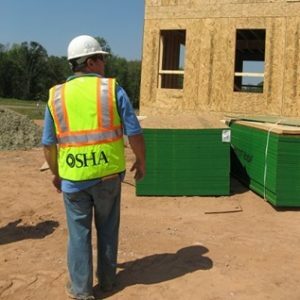 Fall protection training requirements: 1,982 citations—Employees should be trained to use fall protection methods such as guardrails, safety nets and personal fall arrest systems, and employers should verify that employees have been trained by preparing written certification records. 9. Machine guarding: 1,972 citations—Machine parts can cause serious injuries, but the risk is substantially reduced by installing and maintaining proper machine guards. 10. Eye and face protection: 1,536 citations—Safety goggles, masks and other equipment can help prevent eye injuries, which cost employers an estimated $300 million every year in lost production time, medical expenses and workers’ compensation claims.